But this thought was wrong. Over the last several months, I have had various conversations with men about their perspective on #MeToo. And what I’ve found has been disheartening to say the least. Now please don’t get me wrong: it’s not that most of the men I’ve spoken with disagree with the movement. But they don’t necessarily strongly agree with it either. Read more. To me, the Project Hope L.A. Benefit Concert was an awesome experience that demonstrated how we as artists can use both media and our artistic talents to unite the Los Angeles community. Uniting Los Angeles is one of the best actions artists can take in order to solve one of Los Angeles’ biggest problems, homelessness. Read more. Raicho Hiratsuka is the first modern feminist in Japan. Raicho helped to start the women’s movement in 1911. 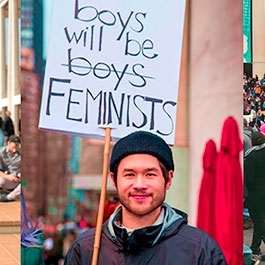 Even so, as I was being raised in Japan, feminism was not actively discussed. Even when I was studying in college, I did not encounter any classmates that openly declared that they supported feminism. I started to be more exposed to the idea of feminism when I came to the United States. Coming to the United States led me to start recognizing the objectification of women in Japanese media. The first time I acknowledged the gender inequality in Japanese media was two years ago. A popular Japanese entertainer named Becky experienced unfair treatment. She had been one of the most popular television talents for roughly 15 years and had recurring appearances on 10 different commercials and 6 variety shows. Then the press found out she was having an affair with a married Japanese musician. After this incident she disappeared from all media. Justin McCurry wrote in his article titled Downfall of Japanese TV’s girl next door highlights wider industry sexism, “her alleged lover, a pop singer, carried on his career apparently unaffected”. This example reveals how Japanese media portrays women unfairly and it highlights the importance of maintaining an image for Japanese female entertainers. Read more. PSA for the New Hope Foundation: MISC has produced a PSA for the New Hope Foundation on the subject of hospice care. The PSA intends to promote new nationwide policies that focus on end of life care. Watch the video. Cancer Care: MISC partnered with USC Norris Comprehensive Cancer Center to produce a video that highlights the importance of participating in clinical trials. The video illustrates the value in allowing one's data and tissue samples to be used in clinical studies for the prevention and treatment of cancer. Watch the video. 2017 was a year of deeply disconcerting political turmoil, societal upheaval, natural disasters, brutal awakenings, and a widespread sentiment of “can this year be over already?” It’s very easy to adopt this sentiment and look back at the year in disgust, but 2017 was also a year for some of the most powerful films that inspired social change, and it’s more important than ever for us to honor them before jumping back into our continued fight against injustice in the new year. Time Magazine’s selection for “Person of the Year” of 2017, the silence-breakers, or the women and men who spoke out against systemic sexual harassment. . . Read more. 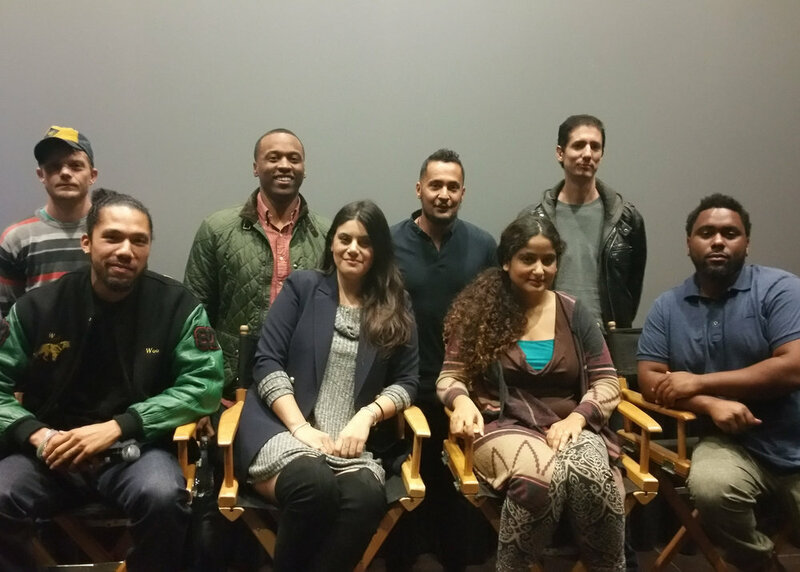 In November, MISC Fellows went to UTA to meet with Rene Jones. In the meeting Ms. Jones discussed how UTA makes a positive impact in the media as well as throughout the agency. UTA pairs their clients with social issues, big or small, hoping to bring awareness and positive change. Within the agency, UTA encourages its employees to apply to have a dream of theirs sponsored. For five days UTA employees can fulfill dreams ranging from going on a silent retreat to giving back to the community with volunteer projects. After the screening there was a Q&A with the filmmakers, a truly diverse group of people. From the conversation that ensued, it was clear that each filmmaker had a personal connection to the stories they told. Read more. The Media Institute for Social Change (MISC) continues to accompany MTV, Comedy Central, the Elton John Aids Foundation and others with its own Kwippit channel. Kwippit aims to be a new form of messaging that enhances your ability to express yourself. Using animation and customization illustrations, our channel offers dozens of ways to express your opinions on the social issues you care about. Download it on the iTunes App Store here or on Google Play here. SHAYDA FROST, A RECENT GRADUATE OF THE UNIVERSITY OF SOUTHERN CALIFORNIA’S SCHOOL OF CINEMATIC ARTS, TACKLES ACCIDENTAL GUN DEATH IN CHILDREN IN 60 SECOND PSA "LOCK LAW". 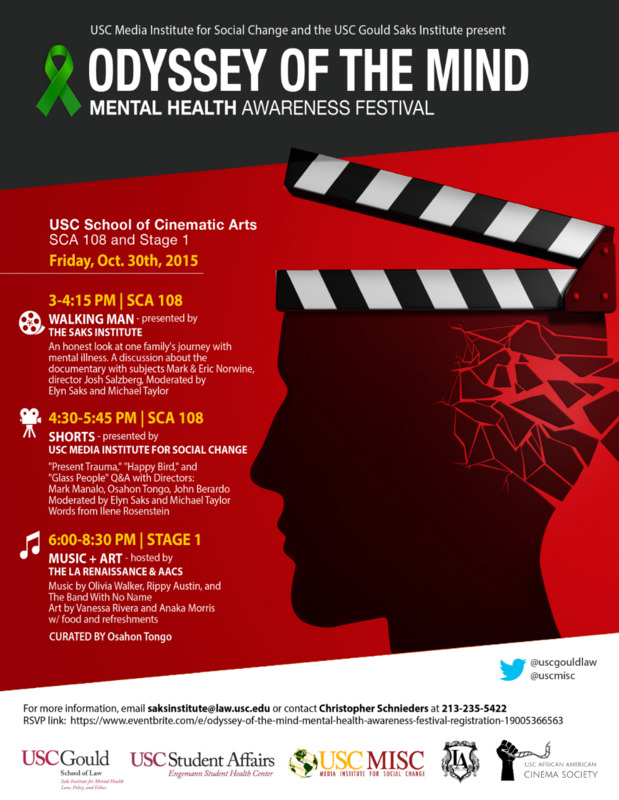 Filmmakers, critics, scholars and policymakers convene to discuss how mental illness is depicted in media and how society views the many issues that impact us all. 1 in 10 people will suffer from the condition called Complicated Grief after the death of a loved one. USC MISC produced a PSA for the New Hope Foundation to raise awareness of the condition and inform people of the various treatments. The PSA will be broadcast nationally later in the year. The Pamoja Project has completed post-production. The film will be submitted to film festivals in April. Stay tuned for screenings near you. The film follows 3 women in Tanzania working to create change in the areas of education, business and entrepreneurship. Congratulations to our 2016-2017 USC Media Institute for Social Change Scholars! Miriam Arghandiwal is a Bay Area Afghan-American with a background in conflict journalism, politics, marketing and community outreach. Rukayat Giwa was born in Lagos, Nigeria and raised in Bakersfield, California. She received a graduate degree in educational studies and taught high school mathematics in Morrow, Georgia. She plans to use media to entertain, educate end empower people of color. Born in Paris, Anna Lisa McLelland worked in a refugee center in Israel and served as speechwriter for Queen Noor of Jordan. A nomad by nature, she writes about lost homes. Julia Van Valkenburg is a media and pop culture blogger from Tucson, AZ. She joins MISC as a cinema and media studies MA with a background in production. Jonatas da Silva was born in Brazil and raised in West Africa. He speaks 5 languages and has a passion for travel. He comes to MISC after working as a Media Producer for Orphan's Promise. Funding from the National Institutes of Health (NIH), partners USC MISC with the USC Keck School of Medicine for a series of videos on Big Data. Digital data is being collected all over the world very quickly and has increased in quantity faster than anyone expected. The organization and sharing of this data is crucial to the ongoing work of biomedical research and in many ways the future of medicine depends on it. MISC will be working in collaboration with researchers at the Keck School to document their work and we will produce films intended to convey the magnitude of this issue. THE INTERPRETER: After a several years of struggling to get clearance to bring Afghan interpreter Saifullah to the United States, film director Robert Ham welcomed him to San Antonio last month. Robert Ham and The Interpreter team now look forward to dramatizing this effort in the film which will begin pre-production this summer. Based on true events, The Interpreter is about an Afghan interpreter working for the US Military, hunted by the Taliban while seeking asylum. PAYA: The Water Story of the Paiute Hits festival circuit. PAYA: The Water Story of the Paiute, a Her Pictures Production in Association with USC Media Institute for Social Change and Owens Valley Indian Water Commission had its world premiere at the Red Nation Film Festival Nov 12th at the Laemmle Music Hall in Beverly Hills where it won the Best Documentary category. The film recently screened at the Native Women in Film & TV festival in Santa Monica and continues to make its way through the festival circuit. Paya has also screened at local theaters throughout California to sold out audiences and is currently on a national university tour. The filmmaker, Jenna Cavelle, is currently developing the short film into a feature length documentary with an associated water rights outreach campaign. Odyssey of the Mind - A Mental Health Awareness Festival. MISC has partnered with Music for Relief to complete a documentary series on the Sunset Marquis Summer Concerts from May through October 2015. The Sunset Marquis hotel has been the rock mecca for the last 60 years, and each summer they hold a concert to mainstage musicians at the start of their careers. MISC has been following each artist as they take the stage and perform their original work. Music for Relief is a non profit organization dedicated to providing aid to natural disaster survivors and protecting the environment. #FIGHTFAKE: Over the summer MISC produced a PSA for the USC Licensing and Trademark division to remind people to purchase authentic CLPA branded apparel. The PSA is live online and will play at all home games for USC sporting events. CROSSING DESERT AND SEA: Director Grazyna Kolondra traveled to Jordan this summer to document the use of art to empower Syrian and Iraqi refugees. Kolondra's research indicates that inspiring children to express themselves through art sheds light on the refugee experience and raises awareness of this issue affecting displaced people. Youth at Zaatari Refugee Camp in Jordan share artwork with Director Grazyna Kolondra and team. See more of the children's work here. MISSING: A short film directed by Blerim Gjoci, slated to begin shooting in December tells the story of a woman who fights to keep her missing husband "alive" even if it means losing everything in the present, including her son. This film intends to create awareness around the issue of the 90,000 people who are missing in the US at any given time. USC MISC has been awarded a grant from the National Institutes of Health (NIH) which will fund a two year partnership with the Keck School of Medicine on the subject of Big Data. Digital data is being collected all over the world very quickly and has increased in quantity faster than anyone expected. This data is not currently being shared among scientists in any organized way, and there is no central place where it is being housed. The organization and sharing of this data is crucial to the ongoing work of biomedical research and in many ways the future of medicine depends on it. MISC will be working in collaboration with researchers at the Keck School to document their work and we will produce films intended to convey the magnitude of this issue. USC undergraduate students have the opportunity to pursue the minor in media and social change offered by the School of Cinematic Arts. We hope the minor will attract students from all fields of study who want to learn how they can influence the future by integrating social issues into their work. We're upgrading our youtube channel into a pro-social video hub. If you've created a video and would like us to feature it, email a link and description to info@uscmisc.org for consideration. PAYA: The Water Story of the Paiute, a Her Pictures Production in Association with USC Media Institute for Social Change and Owens Valley Indian Water Commission premieres November 12 at the Red Nation Film Festival. PAYA documents the history of Paiute Native Americans who constructed and managed 60-miles of intricate irrigation systems in Owens Valley for millennia before LA secured its largest source of water through modern engineering. After the Indian War of 1863, surviving Paiute returned to the Valley from the Eastern Sierra and White Mountains to find their ancient waterworks taken over by white settlers. Today, 150-years later, the Paiute continue the fight to save their waterworks, which are remnant in the Owens Valley landscape. PAYA (“water” in Paiute) stands to recover Paiute water culture and history through this documentary film. THE INTERPRETER: In a recent trip to Washington D.C. the filmmakers began development interviews and secured the life rights to the stories of soldier, Matt Zeller and his Afghan interpreter, Janis Shinwari and are now in development on the feature film. The short proof of concept film has raised half its financing and is currently seeking a matching funder. USC Media Institute for Social Change is a nonprofit organization of industry professionals who use cinema to create an awareness of social issues and inspire positive actions throughout the world. With a mission to support emerging media makers who weave pro-social messaging into their stories, USC-MISC is changing the world one film at a time. Live@SunsetMarquis' summer benefit concert series: The live music events support emerging artists and Music for Relief, a nonprofit organization founded by the band Linkin Park to aid disaster relief efforts and their work with environmental issues. Trademark and Licensing PSA: USC-MISC is shooting a public service announcement for the USC Office of Trademarks & Licensing, which will highlight the benefits of purchasing licensed merchandise and the societal risks of buying counterfeit products. The Interpreter: One interpreter from the Afghan War is killed every 36 hours by the Taliban while waiting on a special immigrant visa promised by the US government. You can watch the trailer and learn more about the project from Robert Ham & USC-MISC's Jenna Cavelle on The Interpreter's kickstarter page, which is live now. Faisal Attrache's "Growing Home" recently won the Jury Award for Best Documentary Short at the Newport Beach Film Festival. Visit the film's website www.refugeebarbers.com to watch the trailer and learn more about how "Growing Home" is spreading awareness about the conflict in Syria. This upcoming semester, all USC undergraduate students will have the opportunity to pursue the minor in media and social change offered by the School of Cinematic Arts. We hope the minor will attract students from all fields of study who want to learn how they can influence the future by integrating social issues into their work. We are pleased to announce the recipient of this year's USC-MISC Scholarship is Liv Nelson! On March 14th, 2015, Variety and unite4:good will join USC-MISC to present the inaugural conference4:change uniting leaders across all platforms of the entertainment industry to exchange ideas on how to deliver messages that fuel positive social change. We have been working with SCA to develop a Media and Social Change minor and the proposal has been officially approved. The Media and Social Change minor will become available for undergraduate students to pursue in the Fall 2015 semester! Applications for the $5,000 USC-MISC Scholarship are now being accepted through March 1st, 2015. This award will go to one USC SCA Graduate Student who has proven dedication to creating social impact through his/her work. Recipient to be announced March 4th. Click here for more information! We are in post-production on a PSA recently filmed for Save The Children's early childhood education initiative. Look for its release later this year! We are currently developing the first Conference4Change in partnership with Unite4Good and Variety. Entertainment industry leaders and artists will unite to share ideas, explore creative opportunities, and engage in work committed to infusing the most pressing social issues of our time into the stories we tell. USC Media Institute for Social Change is a nonprofit organization of industry professionals who use cinema to create an awareness of social issues and inspire positive actions throughout the world. With a mission to support emerging media makers who weave pro-social messaging into their stories, USCMISC is changing the world one film at a time. USC Media Institute for Social Change (MISC) founder, Michael Taylor, is pleased to bring you MISC's Summer newsletter! You are receiving this newsletter because you or someone you know expressed interest in MISC. If you would prefer to log on to our website at your leisure to view archived newsletters or not to receive the newsletter, please adjust your "subscription preferences" or click "unsubscribe" at the bottom of this email. Otherwise, you will continue to receive periodic newsletter updates. MISC produced the PSAs Help A Soldier Heal, Post and Text Responsibly and the half-hour program Power of the PSA in partnership with CBS and KCAL-9, all of which were nominated for THREE Emmys! They were completed and aired in April on CBS and KCal-9. Nominations were announced in May. 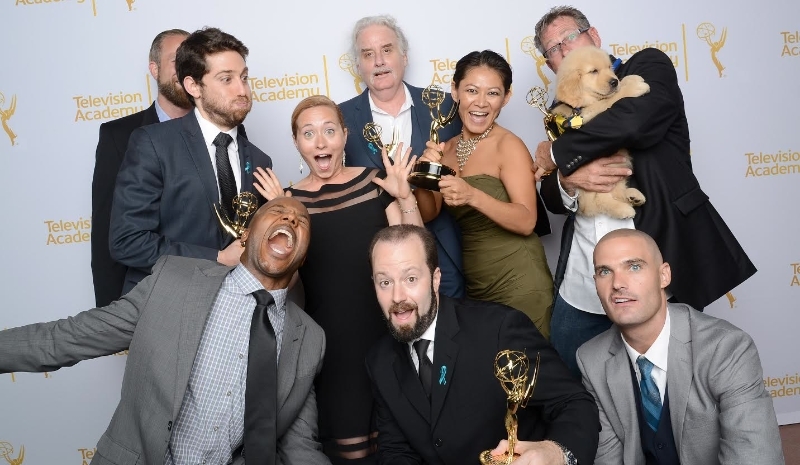 MISC filmmakers to attend the July Emmy award ceremony. Stay tuned for red carpet photos! MISC created iLA as part of Georgio Armani's CITY OF FRAMES. The short film is about a paparazzo who uses cyber technology to track down one of Hollywood's biggest starlets in Los Angeles 2020. 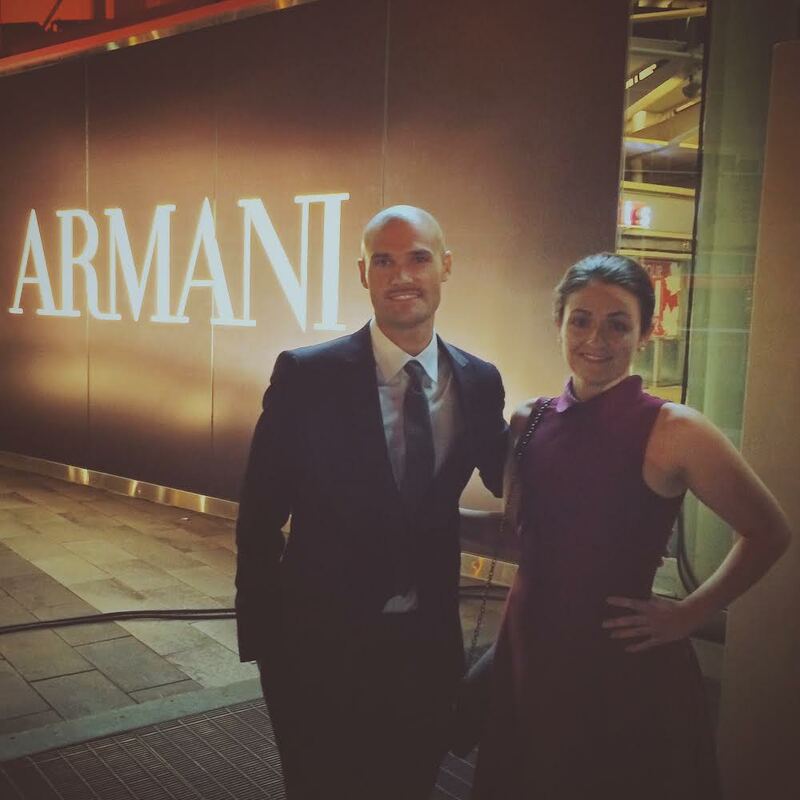 The film will debut at the Toronto Film Festival in September as part of Armani's launch of a series of six films featuring different cities around the world. A five-part promotional documentary series I Make Movies made in partnership with the Motion Picture Association of America to promote jobs in the entertainment industry. MISC is currently developing a film with the Save the Children foundation to raise awareness about the impact of early education on brain development. Save the Children invests in childhood - every day in times of crisis and for the future. In the United States and around the world, they give children a healthy start, the opportunity to learn and protection from harm. Camera drones are inevitable and stand to change the film industry in new and exciting ways but there are many privacy and safety issues to investigate. MISC intends to be a major player in shaping these discussions and informing regulatory frameworks. Stay tuned for more information as MISC develops relevant projects. Check out this recent article from the Hollywood Reporter on this hot button issue! WE WANT YOU! Click Here and Get Involved with USC MISC Today! Read Getting the Girl: Hollywood's Conquest Dilemma covering MISC Founder Michael Taylor's interview with MASHABLE about violence in the media. Increasing the visibility of women in television, MISC team member Nancy Forner has been hard at work all summer as an editor on the second season of Lifetime's Witches of East End. MISC team member Jenna Cavelle receives "Honorary Community Building Through Film Award" from Students of the World and Pivot TV for directing Freestyle Dreams, a short documentary about hip-hop and at-risk youth. The documentary Living in the Rain Shadow on which Jenna Cavelle worked as a cinematographer along with director Ryan Christensen was released in July by the California State Water Resources Control Board. The film is used to build awareness at the citizen, municipal, and state levels and inform policymakers about poor access to water in disadvantaged communities. USC Media Institute for Social Change is a nonprofit organization of industry professionals who use media to create an awareness of social issues and inspire positive actions throughout the world. With a mission to support emerging media makers who weave pro-social messaging into their stories, USCMISC is changing the world one film at a time.